← 091 "$pringfield (Or, How I Learned to Stop Worrying and Love Legalized Gambling)"
"Oh my God! Underage kids drinking without a permit!" The family collides with each other and disappear in an explosion. I am not authorized to fire substitute teachers"
Homer the Vigilante is the eleventh episode of season 5. It originally aired on January 4, 1994. It guest stars Sam Neil. "While a cat burglar prowls Springfield and evades capture, Homer forms a vigilante group to protect the city. But the power quickly goes to his head and an unlikely source figures out the identity of the cat burglar." A crime wave hits Springfield: Many people report having personal items stolen, among them Lisa's saxophone. The spree is the work of a cat burglar who leaves his business card at his crime scenes. Even with this clue, the police are powerless to catch him as they are overwhelmed by all of the crime going on. Homer decides that he should find the criminal in order to get Lisa's stolen saxophone back. He starts his own vigilante group, but they cause more crimes than they prevent. When they find out the burglar's next robbery will be stealing the world's largest cubic zirconium from the museum, Homer plans a stakeout. However, he is distracted by a group of underage kids drinking. Instead of watching the museum, Homer joins the kids' party and gets drunk while the cat burglar breaks into the museum and steals the zirconium. All of Homer's vigilante groupmates quit and everyone in town turns against him. Grampa then reveals he knows who the cat burglar is: Molloy, one of Abe's fellow residents at the Springfield Retirement Castle. To prove it, Grampa takes the group to Molloy's room at the Retirement Castle, where the museum's stolen cubic zirconium is prominently displayed on Molloy's coffee table. The townspeople confront Molloy, and he freely admits guilt, politely gives back their items, and apologizes for his misdeeds. His apology touches the townsfolk and they want to let him go. Chief Wiggum, however, reminds everyone that Molloy did break the law and throws him in jail. The next day Homer visits Molloy to taunt him. Molloy then tells Homer and Wiggum that he has millions of dollars hidden under a big "T". Homer breaks the news to the townspeople, and they embark on a search for the treasure. However, the effort quickly dissolves when the Springfieldians find a plethora of possibilities right near the police station: The Big T Building, Big T Burgers & Fries, The Tea Factory and Big T Theatre. They return to the jail and Wiggum asks Molloy for more information. Molloy says the treasure is at 4723 Maple Valley Road; then, when the Springfieldians still look confused, he gives detailed directions to the site. Chaos inevitably ensues, with everyone in Springfield racing to find the treasure. They find the site (a palm tree shaped like the letter "T") and begin digging. Eventually they find a suitcase with a note saying that while they were looking for the treasure (which doesn't exist), Molloy has already escaped from jail. Mayor Quimby still insists they keep digging, hoping to find something. Sam Neil guest starred in the episode as Molloy. He considers recording this episode to be a "high-point" of his career. One scene of the episode features Kent Brockman reporting on the burglaries. He says: "When cat burglaries start, can mass murders be far behind? This reporter isn't saying that the burglar is an inhuman monster like the Wolfman, but he very well could be. So, professor: would you say it's time for everyone to panic? ", to which a "professor" replies: "Yes I would, Kent." According to David Mirkin, this was a joke the staff enjoyed doing because it pointed out how negative and mean-spirited news broadcasts can be. In its original broadcast, "Homer the Vigilante" had a Nielsen rating of 12.2 and was the highest-rated show on the Fox network that week. The episode has received mostly positive reviews from television critics. The authors of the book I Can't Believe It's a Bigger and Better Updated Unofficial Simpsons Guide, Warren Martyn and Adrian Wood, thought it was "a bit lacking in focus", but it contained "a number of satisfying set-pieces — we like Professor Frink's walking house security system — and displays Wiggum at his all-time most useless." DVD Movie Guide's Colin Jacobson wrote: "After the many plots of the prior show, 'Vigilante' maintains a much tighter focus. It’s not quite as wonderful an episode as its immediate predecessor, but it’s strong nonetheless. Much of the humor comes from Homer’s newfound power and abuse of it. If nothing else, it’s a great program due to Homer’s reaction to Lisa’s jug playing." Patrick Bromley of DVD Verdict gave the episode a grade of B, and Bill Gibron of DVD Talk gave it a score of 4 out of 5. 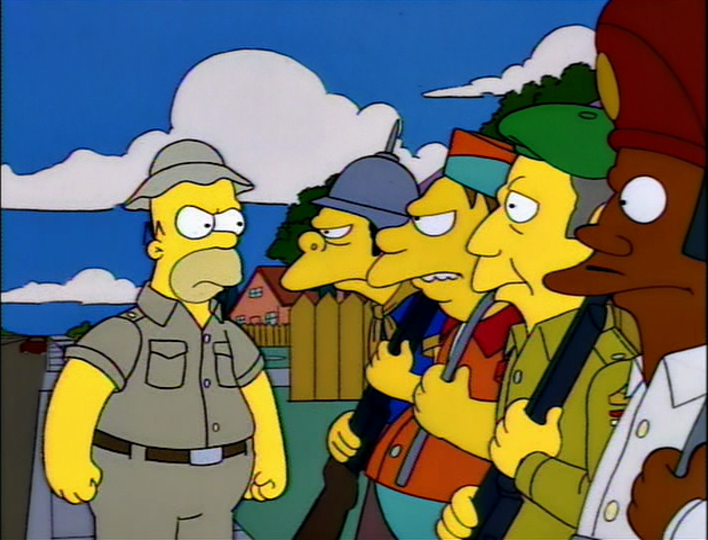 Wikisimpsons has a collection of images related to "Homer the Vigilante". ↑ David Mirkin (2004). Audio commentary for Homer the Vigilante, The Complete Fifth Season. Modified on October 23, 2018, at 07:26.